After a major hurricane, you may find yourself without power. One way to restore some power to your home is by using a portable generator. Although generators are extremely useful tools, they can also be extremely dangerous if not used correctly. Orange County is asking residents to take a moment to review these important generator safety tips to be safe this hurricane season. First, review the owner’s manual and follow all instructions that come with your generator. Placement of the generator is also critical, as you should never use one indoors or in partially enclosed spaces, even those with partial ventilation. Never run a generator in areas where people or animals are present. Opening doors and windows or using fans will not prevent carbon monoxide build-up in the home. Always connect a generator to the appliances with heavy-duty extension cords. Hooking up your generator directly into your home power supply could energize the outside power lines and electrocute an unwary utility worker. If you must connect the generator through the house wiring to power appliances, use a qualified and licensed electrician to install an appropriate power transfer switch. Last, never store fuel for your generator in your house, and do not store fuels near a fuel-burning appliance such as a stove or water heater. Before refueling the generator, turn it off and let it cool down. Gasoline spilled on a hot engine can ignite. For more information on generator safety and how to prepare for a hurricane, visit www.ocfl.net/storm. 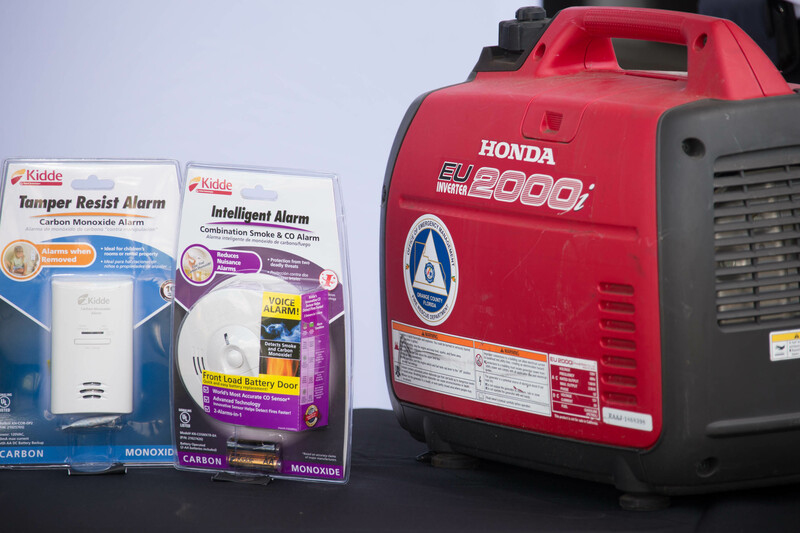 Photo Caption: Residents should always have a carbon monoxide alarm when operating a portable generator.